One of the absolute best ways to position yourself as a thought leader and industry expert is as a featured public speaker. The opportunities are manifold to get in front of meaningful groups with an informational message that is perceived as valuable by the audience. Reason number two (OK, let’s get it out of the way right up front!). Fear of public speaking ranks a close second to the fear of flying. That’s kind of scary, but the flip side of that coin is you will have limited competition if you hone your public speaking skills. Here are eight proven ingredients that lead to public speaking perfection. You and Them (your audience) … Every person in your audience is as nervous as you are when called upon to speak publicly. You are alike on that issue. Being alike is the foundation for rapport. And that’s good news for you. They want you to succeed. They are allies, not adversaries. So relax. Your Speech Ain’t for You … It’s for them. You want something out of your performance and so does the audience. You won’t get what you want unless you give them what they want. Getting Ready to Get Ready … Tailor your speech for your audience. Ask yourself, “What do they want to walk away with that is valuable and memorable?” Limit your message to no more than six major points. Preparation Trumps Inspiration … Write your speech. Not because you intend to read it, but because it will force you to think clearly about the major points you want to drive home. And then practice, practice, practice. Tell ‘Em What You’re Gonna Tell ‘Em … Know the first few sentences of your speech by heart. Begin with a strong opening that emphasizes the benefits the audience will enjoy from your speech. It will anchor your confidence, engage the audience and enhance your delivery. Tell ‘Em … Act confident and you’ll be confident. People remember pictures, not statistics. Use stories to illustrate your points. Stay disciplined and stick to the main points of your talk. Tell ‘Em What You Told ‘Em … Summarize your main points and close with a call to action, i.e. what next step your audience can take to benefit from your talk. This article and the many books on public speaking are fine when you are “getting ready to get ready” to speak. However, the only path to mastery is to speak. Join a local Toastmasters group to hone your skills in a supportive, non-threatening environment. 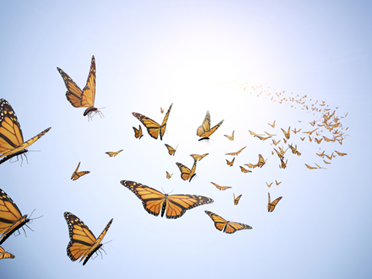 That’s the fast-track to putting your butterflies in squadron formation. And then deliver your next speech in a fashion that will make both you and your message memorable.